An exhibition that opened in May 2015 and closed the way it commenced, with a party, on September 26th, 2015, was Rob Pruitt’s 50th Birthday Bash, at the Brant Foundation Art Study Center. The exhibition encompassed the entire interior of the foundation as well as a few works peeking, literally, from the surrounding trees. Encapsulating works from Pruitt’s many years as an artist, the exhibition functioned almost as a retrospective, bringing together paintings, sculptures, and an ongoing Flea Market project, which lives on via Ebay. 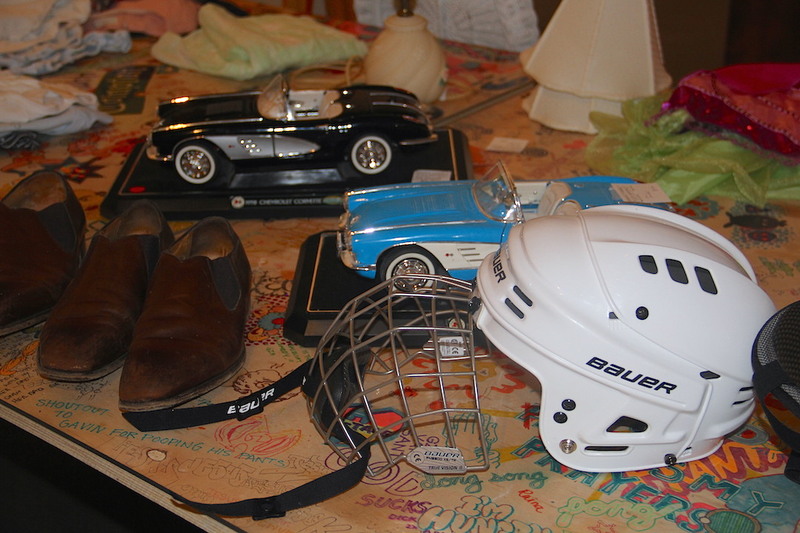 On this occasion, the artist asked the Brant family to participate contributing items that they no longer wear or need. All of the profits from sales went to the art department at Bard College. Held in the lower level of the Foundation, the sale occupied many tables and clothing racks, while a smaller room, usually used for video installation, was dedicated solely to fashion items (shoes, dresses, jeans) of the Brant matriarch, Stephanie Seymour. On the day of my visit, much had been picked over, but the stock was still strong and I left with a boys size Polo shirt covered in hand-written graffiti, (part of Pruitt’s project) and a pair of Alexander McQueen jeans previously owned by Seymour (yes, they fit). 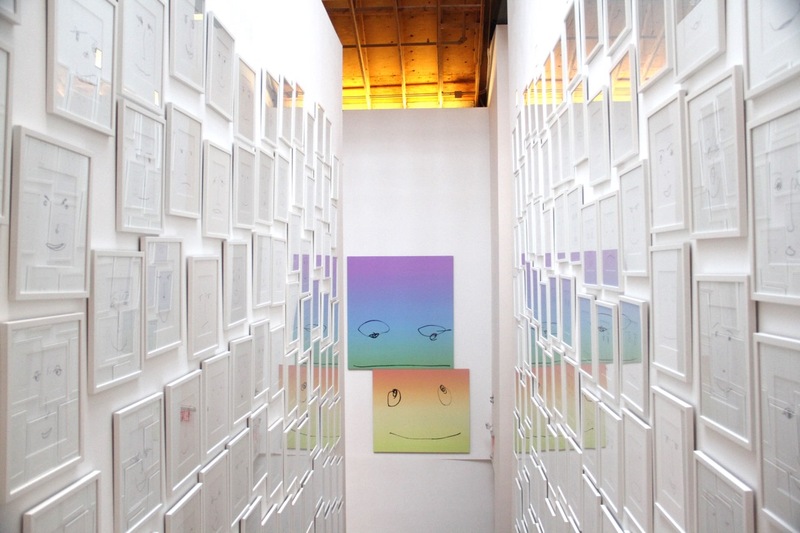 There is a visual simplicity to Rob Pruitt’s work that is easy to digest and comprehend but also aesthetically pleasing. He uses familiar tropes that one may associate with art, but with a twist. 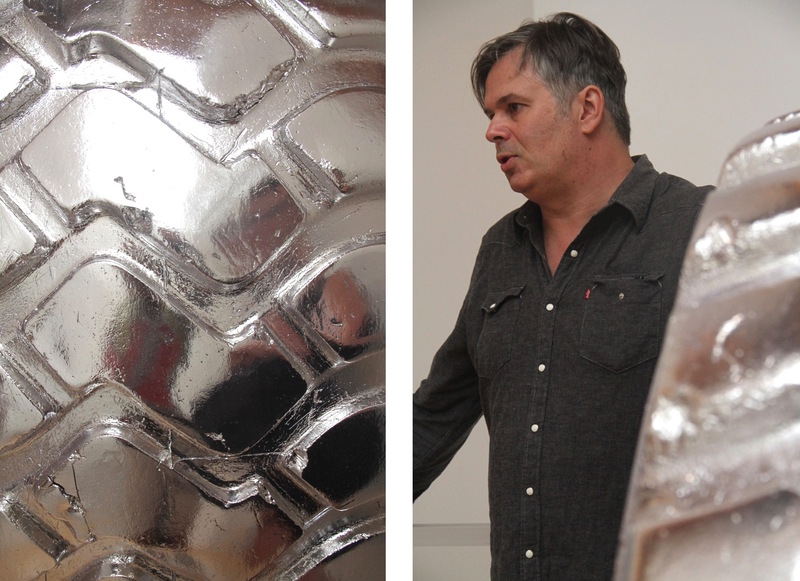 As with most artists, he combines obsession with material exploration. One of the most interesting sculptures was “Esprit de Corps (Hokusai’s Great Wave)”, 2015 , an installation using JCrew denim and cement to make a kick-line, frozen in it’s proposed movement. The piece, obviously weighted by the cement, has a grounded presence and although dense, is lightened by the jovial gesture. 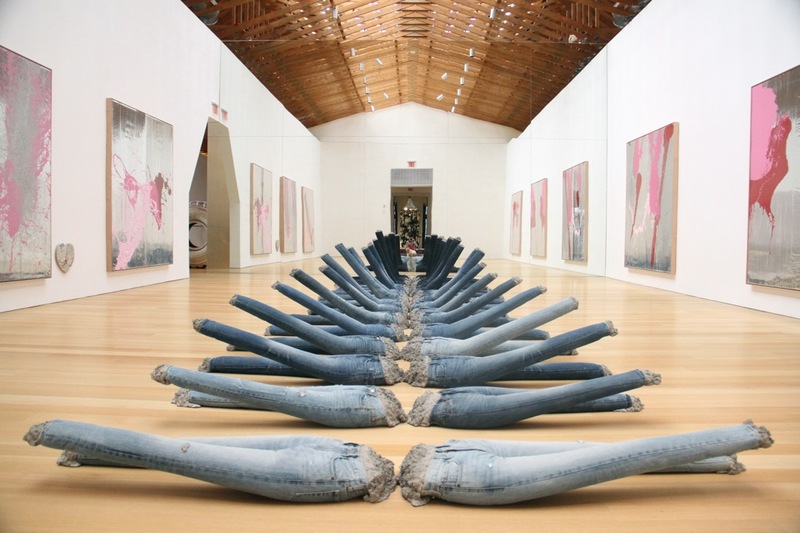 There is also a fragility to this piece, the denim almost feeling like skin, ready to tear at any time. Functioning as a home to some of his greatest hits, Pruitt stated, “It’s just as fun to ruin something as it is to make something.” Then pointing to an ongoing project consisting of generic, mass-produced paintings that he busy from Ikea and the like and then paints over them in oil paint said, “I don’t even know if they are good. Are they good? Do you like me?” His audience, on this day a gaggle of power Instagrammers, giggled nervously, maybe aware in that moment that their respective numbers of followers could even bring a well-known artist to his knees, well, even if metaphorically. While known for his glittered panda bear paintings and more recently drawings made on digital gradient canvas, Pruitt states, “Once the drawings have been made, they are married to the gradient canvases. I’m trying to create human emotion in a very simple way. I try to elicit human emotion [as well] but I”m not always successful. I once made one [of these drawings] I titled “Baby” and someone told me that they saw someone crying in front of it at an art fair, so that worked.” This particular series, has a way of arousing human response with simple line drawing on a colorful surface. The word ‘arousing’, isn’t indicative of a sexual response but rather if the painting functions, than a viewer may find the corners of his or her mouth turn up in a grin. On the day of the closing, the Brant Foundation invited 97 homeless youth and mentors from the art world to tour the exhibition and the participate in a making a project based on Pruitt’s work. In it’s second year, Free Arts NYC gave homeless youth from the Department of Homeless Services, the chance to visit the gorgeous facilities of the Foundation, but also take part in an arts and crafts project based on Pruitt’s exhibition. The children made a selection of emoji-face tote bags, aluminum paintings, and model magic pandas. In a world where much art can be acquired only by the 1 percent, Free Arts Day, can function as a crystal ball of sorts quietly stating, yes kids, if you work hard and hold onto your dreams, one day, even you might be able to make serious art that at first glance, appears silly.